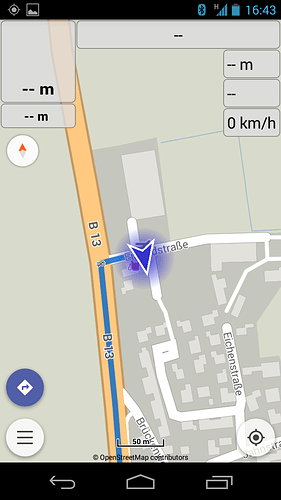 Yesterday I had the first opportunity to test my 10 Euro-App Kurviger Pro with my scooter - and finished after about 6 minutes. I had massive problems with the live view of my actual position plus the direction of the route not being shown in the correct ( driving ) direction - but somehow different or the other way round. 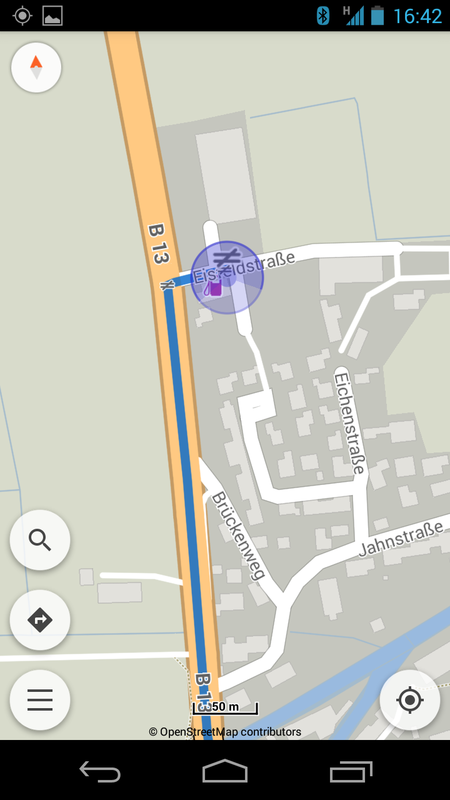 In addition the ‘route behind’ was still colored in the same color as the one in front of me - so I did not exactly know in which direction I was moving at that moment. This was also due to the position being shown as a kind of a transparent circle - but not as an arrow with the driving direction pointing forward. Have you pressed the navigation button at bottom-left? Then the app should work in navigation mode like here. Did you get better experiences in the meantime (as the title of this topic still sounds very disappointed)? I changed the title to ‘tricky’ if that is ok for you Uli. Yes, in the meantime and after some more experience ‘outside’ things went better. At the moment there is still one issue which does not seem to work that well - and this is rechosing the route when it had been changed by me. 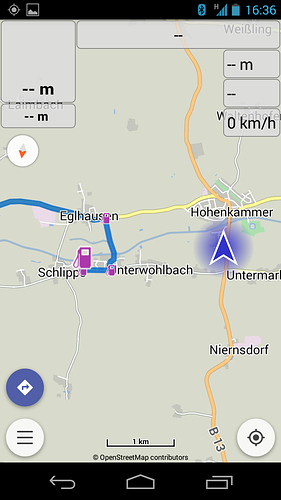 When I drive another route than the one elected by Kurviger - it first takes relatively long until a new route is chosen. And, a little more uncomfortable, yesterday it has taken place two times that after Kurviger has ‘rerouted’ that the info data on the left and right upper side ( time left, driven speed and so on) stays empty - although I have enough radio reception for the phone. I could only solve this by stopping, deleting the old route, importing it again - and restart. Afterwards the info data was filled in as usual. Is this a bug? 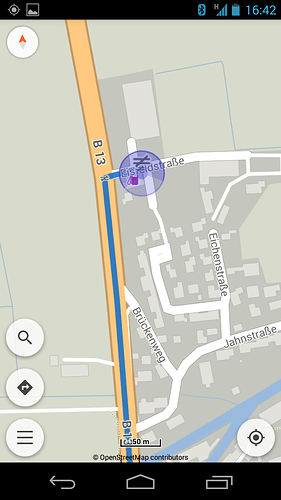 Last question ( for the moment) - the area which shows up on the smartphone´s display, is relatively close, so I see the next crossing only a very short while before is it coming near. Is there a way to increase the scale of the screen a little more to have a better overview? 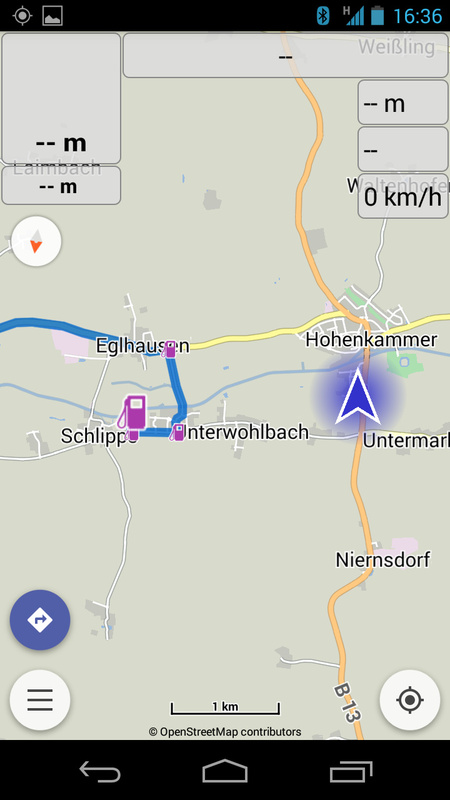 When I drive another route than the one elected by Kurviger - it first takes relatively long until a new route is chosen. This sounds to me like you have (temporarily) lost internet connection. In my experience the new route is calculated usually in less than 5-10sec - even if internet quality is only Edge. If you could take a screenshot of such situations it might help the developers to solve the issue. In very rare occations I had similar observations. The pattern seems to be many routing calculations in a row without following the new calculated route, but take another one instead. Automatic recalculation was on btw. Only after restarting the App it continues to work as expected. 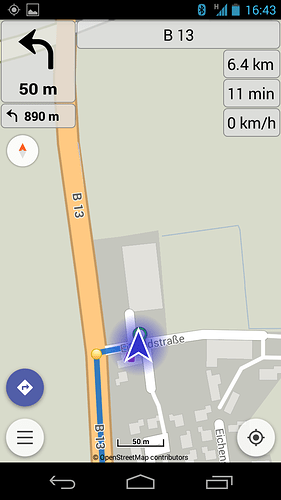 These screenshots had been taken on my old Galaxy Nexus with Android 4.3 and I was never able to reproduce this. Now I have a new phone. Yes, of course! Thank you, in the name of the developers too! Hi Manfred, I thought this too in the beginning, but the connection was not that bad, therefore I did not understand why it took so long. As mentioned, when I stopped and deleted the actual route, imported it and restarted again - all went well and all add-on data left and right was there again. Seems as if the re-routing or actualizing the route when driving another route than the one on the screen still causes issues from time to time. Your screenshots exactly show what I meant …and my Kurviger is the latest version. Have you tried to press on the navigation button twice to restart the navigation? This should usually solve this issue.